This spectacular quality nature recording highlights the versatile wildlife found in the Australian bush. It was recorded during spring time when the forest comes to life and the many species of birds form a majestic choir in the open forest. There is no music or spoken voice on this CD - just the sound of Mother Nature as if you would hear in the wild. Springtime in the Bush is recorded in high definition digital audio and makes any listener feel like they are in the midst of a spectacular natural wilderness. If you find the sound of wind gently breezing through the forest and birds singing in a natural harmony then this CD is perfect for you. 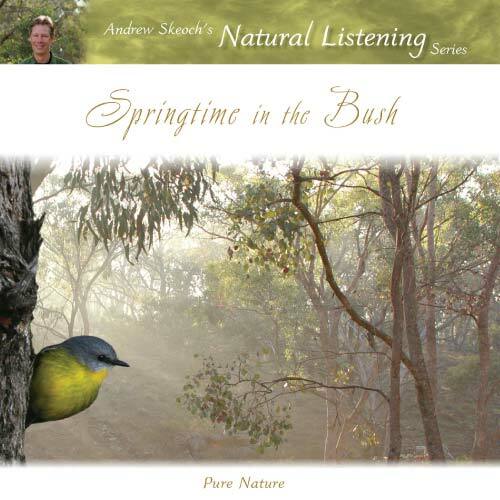 Author Andrew Skeoch and his wife and photographer Sara Koshak have wonderfully captured the true essence of the Australian bushland in this vivid sound recording. As with all of the Listening Earth Nature sounds, this recording is the product of a passion and dedication as Andrew and Sara traveled deep into the remote bushland of Sundown National Park in Queensland to capture this natural symphony. If you are a bird lover, you will hear the sounds from many of the 130 + birds that are found in this region including Kookaburras, Coloured Parrots and Wedge Tailed Eagles. This is a true audio representation of what it is like to be surrounded by the beautiful Australian bush. It is a perfect background soundtrack to play for self meditation and self hypnosis. Many hypnotists use this CD as a backing track for when they have a client. It is equally effective just to create a relaxing soundscape for when you need to 'chill out', relax or even when you go to sleep of a night time. Falling asleep with the magnificent ambiance of bird song and bushland is a uniquely satisfying experience. With the flowering of gum and wattle comes a blossoming of birdsong. A profusion of small birds move around the treetops, and as the first rays of morning sunlight warm the air, ones spirits are lifted by a symphony of joyous birdsong.